WASHINGTON — Puerto Rico Gov. Ricardo Rosselló on Monday said the deaths related to Hurricane Maria "may be higher" than the official count of 64 and ordered a review of all deaths since the hurricane. 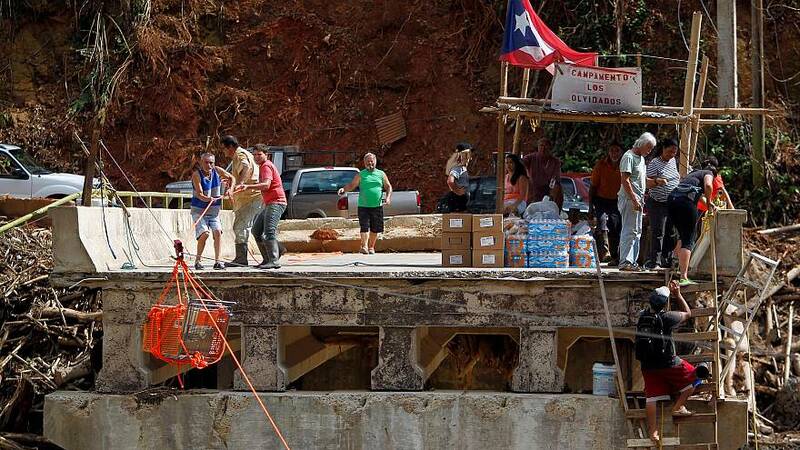 Roselló made the order to the Puerto Rico Demographic Registry, which is the island's vital statistics bureau, and to the Department of Public Safety following investigative media reports on the death toll and after residents claiming deaths of their loved ones were caused by Maria. Rosselló said in a statement he wants a "thorough review and inspection of all deaths that have taken place since Hurricane Maria hit, regardless of what the death certificate says." The governor also said he'd create an expert panel to review the island's death certification process. "We always expected that the number of hurricane-related deaths would increase as we received more factual information — not hearsay — and this review will ensure we are correctly counting everybody," he said. The official count of the number of deaths has been questioned from the start and thought to be low considering the power punch that Hurricane Maria delivered to the island and its destruction that took out much of the island's infrastructure, blocked streets and sewers with debris and left people without electrical power that for many ill and elderly was life-sustaining. Reports emerged of people being unable to use oxygen and dialysis equipment, unable to refrigerate insulin, evacuated from hospitals that lost emergency power and other problems. Reports by the Center of Investigative Journalism in Puerto Rico published in NPR's Latino USA, as well reporting by the New York Times and media stories on individual deaths kept up pressure on the government to reconsider its death toll, despite defense of the count and certification process from administration members. In the second week after the hurricane, President Donald Trump famously praised Puerto Rico for its low death toll — officially at 16 at the time. "If you look at a real catastrophe like Katrina and you look at the tremendous, hundreds and hundreds and hundreds of people died and you look at what happened here ... 16 people certified versus in the thousands ... You can be very proud of all your people, all of our people working together," Trump said. Although Rosselló ordered the review, the governor stopped short of agreeing that the number of deaths had reached to nearly 1,000 or more as the media reports had found. "In the government, we cannot base any official fatality related to the hurricane count on statistical analysis," he said. "Every life is more than a number, and every death must have a name and vital information attached to it, as well as an accurate accounting of the facts related to their passing," he said. Rep. Nydia Velázquez, D-New York, who has been critical of the official death count, said the review is a welcome and overdue step. But she said an independent review still should be done. Velázquez and Rep. Bennie Thompson of MIssissippi, the ranking Democrat on the House Homeland Security Committee in Congress, had asked the Government Accountability Office last week to review the deaths. Velázquez said the request still stands. The request is pending at the GAO, spokesman Chuck Young said. In separate news, the oversight board created by Congress to oversee Puerto Rico's fiscal restructuring announced Monday it is conduct an independent investigation on an estimated more than $6 billion in government bank accounts. The board also plans a hearing next month on where the money came from, the accounts' legality and how the money is to be spent. The questions about the accounts is indicative of the challenge facing Puerto Rico as it struggles economically, the lack of complete, accurate and transparent information on its finances and operations. Christian Sobrino, the governor's representative on the oversight board, said the money was disclosed through an inventory that Rosselló's administration began in July. A document was published Monday providing a snapshot of the island's bank accounts. Before Rosselló took over as governor "there was no such thing as an inventory of all bank accounts across the executive branch of government, Sobrino said. Sobrino said the oversight board was aware of the inventory and was kept informed through the process. He said Rosselló's administration had planned for an independent evaluation by the oversight board and creditor groups once the inventory was done so the fiscal board's announcement was welcome. "This should not provide the impression Puerto Rico is not bankrupt," Sobrino said. The inventory includes accounts with restricted use of funds, such as $400 million for the housing adminstration. He said with its $25 million to $26 million consolidated budget, Puerto Rico has little more than one and half months worth of revenue for operations, Sobrino said. Board Chairman José Carrión said in a statement that Puerto Rico, a U.S. territory, has been without a full set of current audited financial statements for the past several years. Statements for fiscal years 2015, 2016 and 2017 have yet to be issued.